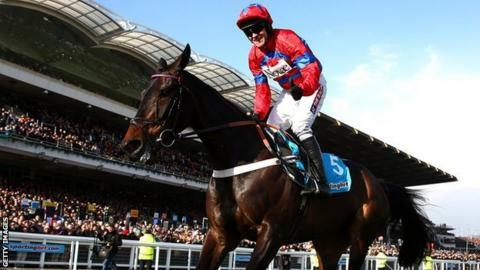 Steeplechasing star Sprinter Sacre thrilled the Cheltenham Festival with a sensational 19-length win in the Queen Mother Champion Chase. The brilliant seven-year-old, trained by Nicky Henderson, cruised around the two-mile contest and left talented runner-up Sizing Europe trailing. "Sprinter Sacre's win was unbelievable. I've never seen anything like it. The British people love a champion - and he's a champion." "It does make you speechless. Sprinter Sacre is scary. He has that aura about him and is totally and utterly unique." "It was like Barry Geraghty pressed the accelerator on a sports car. It was one of the most wonderful things I have seen in sport." "Kauto Star, Desert Orchid, Red Rum and Arkle all gained household-name status but specialised in longer distances, your 'sexier' Gold Cups, King Georges and Grand Nationals. Everyone, not just close-up fans and purists, needs to know news of such flamboyant brilliance: let's shout it from the proverbial rooftops." Sent off the 1-4 favourite, the handsome gelding - nicknamed The Black Aeroplane - was the shortest-priced Festival winner since Arkle won his third Gold Cup at odds of 1-10 in 1966. A crowd of more than 50,000 was left smiling and shaking their heads by the dominant manner of his victory. The magnitude of this triumph can be judged by the distance to Sizing Europe, twice a Festival winner - in the 2010 Arkle Chase and the Champion Chase a year later. Winning jockey Barry Geraghty told BBC Radio 5 live: "He is an unbelievable horse. To beat Sizing Europe the way he did was a remarkable performance. "He was keen early on but settled down. He's a class act. I think the 'Frankel of jump racing' is a fair way to describe him." Henderson added: "That was probably the worst five minutes of my life. Hopefully Barry had fun, but I'm glad it's over. "It does make you speechless. Sprinter Sacre is scary. He has that aura about him and is totally and utterly unique. "He finds it ridiculously easy - he just loves doing it." Sprinter Sacre skipped over the first fence as though it was a hurdle and happily negotiated the remaining obstacles with little fuss. Sizing Europe, second to Finian's Rainbow in the race 12 months ago, went into the lead four fences from home but Geraghty was stalking him with quiet confidence. At one stage it looked as though 2012 Arkle winner Sprinter Sacre might have a duel up the straight with his opponent, but he soon cruised into front and stretched his lead. At last year's Festival, the crowd warmly applauded another chasing great when dual winner and five-time King George VI Chase victor Kauto Star was pulled up in what proved to be his final race. The candle of illuminating jump racing has passed to Sprinter Sacre and he was given an appreciative ovation from punters at the Gloucestershire track. Bookmakers rate him only an even-money chance to win the Champion Chase again in 2014 and 2015. Sizing Europe's trainer Henry de Bromhead accepted his horse had been beaten by a "special one". He said: "We have been beaten by a phenomenon. We had a go, but came off second best." Meanwhile, Lord Windermere was quoted as a 25-1 chance for the 2014 Gold Cup as he scored a fine success in the RSA Chase, which is known as the Gold Cup for novice chasers. Irish trainer Jim Culloty, who famously rode Best Mate to three successive Gold Cup wins from 2002 to 2004, choked back tears as another Cheltenham Festival victory sank in. The day began much as it had panned out on Tuesday's opening day with champion Irish trainer Willie Mullins masterminding yet another victory, in the John Oaksey National Hunt Steeplechase for amateur riders. This time his son Patrick was in the saddle, as he brought favourite Back In Focus past leader Nina Carberry on Tofino Bay. It was a fourth victory at the 2013 Festival for the trainer. Mullins also won the day's final race when Ruby Walsh rode Briar Hill (25-1) to victory in the Champion Bumper. It was Mullins' fifth winner of the meeting and the fourth for Walsh at the halfway stage of the Festival. And a jockey who looks set to have a future at the top teamed up with a potential 2014 Champion Hurdle contender in The New One to claim the Neptune Hurdle. Sam Twiston-Davies was given a rousing reception in the winners' enclosure by fans who were cheered by a win for his father Nigel, who trains just 12 miles from the course at Naunton. However, the trainer nearly missed his son's big moment. "My guts rebelled and I was in the loo for most of the race. Luckily I extricated myself for the final hurdle. I am a very proud dad - he would not have been happy had I missed the whole race!" said Nigel. Flaxen Flare, ridden by Davy Condon, was a big-priced winner at 25-1 for Irish trainer Gordon Elliott in the Juvenile Handicap Hurdle, while trainer Alan King had a one-two with Medinas (33-1) and Meister Eckhart in the Coral Cup.